POHAKULOA TRAINING AREA, Hawaii – Army officials are opening several training areas for bird hunting, here, Dec. 6-7, from 5 a.m. to 7 p.m.
Training areas 1-2, 10-11, 14-16 and the Keamuku Training Area will be open for shotgun hunting of birds only. Use of shotgun slugs is not permitted. All hunters must check in and check out at one of the following hunter’s check-in stations: Kilohana, located on Saddle Road between mile markers 43 and 44; Pu’u Huluhulu, located at the intersection of Mauna Kea Access Road and Saddle Road near mile marker 28; or Pu’u Anahulu, located on Mamalahoa Highway (Hwy 190) across from mile marker 15. Checkout time is no later than 7 p.m. each day. Hunting passes will be provided at the check-in stations beginning Friday after 5 p.m. These passes must be signed and placed on the vehicle’s dashboard. Hunters who do not have a signed hunting pass on their dashboard will be barred from hunting for 30 days. Areas 1 and 2: Through any of gates 1-6 on East Saddle Road. 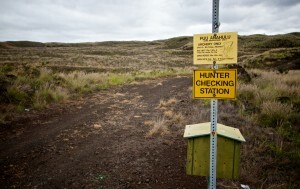 Areas 10 and 11: Through any of gates 1-7 on West Saddle Road, west of Pohakuloa’s main gate. Areas 14-16: Through Gate 2, near mile marker 41, on West Saddle Road. Keamuku: Through gates 2, 7 and 10 on Old Saddle Road or gates 11 and 14 onMamalahoa Highway. Hunters are required to park in designated parking areas. Firearms, alcoholic beverages, all-terrain vehicles, dirt bikes and/or recreational vehicles are not allowed in the training and hunting areas. Hunters with disabilities can call Officer Brian Mabry at (808) 969-2429 for assistance. For more information, call the PTA Hunter’s Hotline at (808) 969-3474, visit www.garrison.hawaii.army.mil/p… and click on the “Hunting” tab, or refer to instructions on the hunting pass.